Relative: lower demand older pt, pts on systemic steroids/methotrexate, IDDM, vascular compromise. Consider limited open repair. Limited open repairs demonstrate no difference in rerupture rate, sural neuropathy, or calf circumference with less scarring and less postoperative complication as compared to open repair. (Aktas S, Foot Ankle Int. 2009 May;30(5):391),(Gigante A, Knee Surg Sports Traumatol Arthrosc. 2008 Feb;16(2):204). Surgery can be done immediately or delayed 7 to 10 days. Delaying can reduce swelling and allow some organization of the "mop-ends" of tendon allowing restoration of the anatomic length. There is no difference in outcomes if repaired within 30 days. Turn-down gastroc fascial flap augmentation of acute repairs does not improve outcomes (Pajala A, JBJS 2009;91A:1092). If V-Y lengthening is needed. The length of the V needed is typically 1.5x the length of the defect to be closed. Prone, all bony prominences well padded. 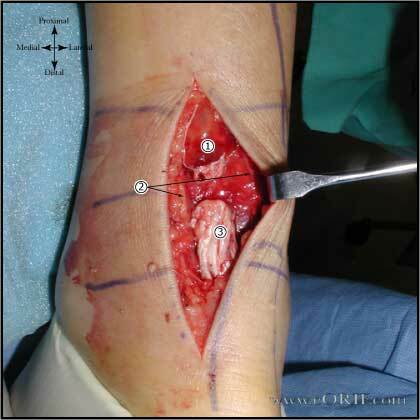 Posteromedial incision (medial to the medial border of the Achilles). Dissect down to paratenon (deep crural fascia), without making large skin flaps. Hematoma evacuated, tendon ends debrided. 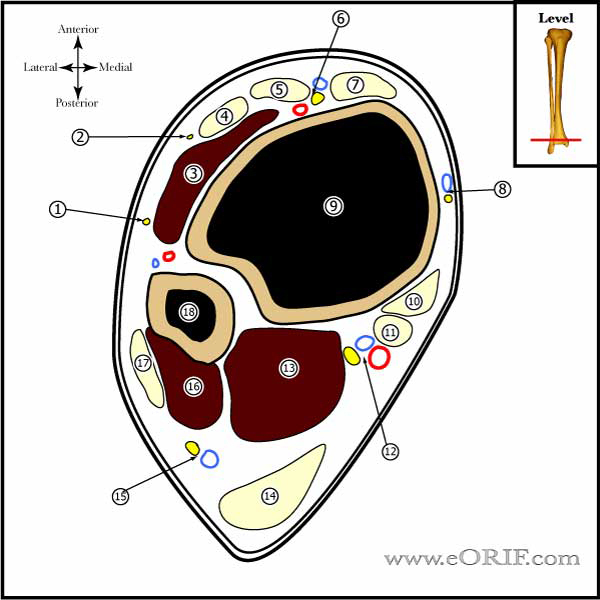 Plantaris tendon passes deep to crural fascia along medial aspect of Achilles, may be used to augment repair. Knee flexed, foot plantar flexed for suture tying. Vertical locking circumferential 2-0 absorbable suture placed to augment repair. Augmentation: gastroc fascial turndown(Jessing P, Acta Chir Scand 1975;141:370), plantaris tendon (Lynn TA, JBJS 1966;48:268), or biologic tissue scaffold. Paratenon repaired with 2-0 absorbable suture. Below-knee bulky compressive dressing with plaster splints holding foot in gravity equines. 10 day f/u, casted at 10-20º flexion, NWB; Consider functional boot with heel wedge. Consider early weight bearing if repair and tissues are adequate. 4wks; functional boot with 20º heel wedge. WBAT. Begin gentle passive ROM, no passive dorsi flexion. 6-8wks; 1” heal lift, begin active physical therapy:passive stretching, active theraband. Heal lift continued until able to reach 10 degrees of dorsiflexion. Perform stretching exercises prior to commencing any sports permanently. May return to sports at 3-4 months.